​In the fall of 1886 a group of people from the Cartoogechaye Baptist Church decided to withdraw from that church and organize another church. The primary reason for this, it was a bit too far to the Cartoogecahye Baptist Church due to the modes of transportation back in those days, primarily horseback or by wagon. This group appointed Rev. J. D. Wright and Rev. Samuel Harrington to organize the church. At the meeting this group pledged to give money to buy a piece of property for the site of the church. However, when they started to buy the property, Mr. Alfred Slagle gave them about an acre of land for the site of the church. A deed for the property was executed on 6th of April, 1887 giving the land to the church. There was a stipulation written into the deed which said that the property would remain Mt. Hope Church property as long as the church existed. The church building was built by Jessie Stalcup and members of the church and was occupied in the spring of 1887. This building was a one room structure that faced west up the Cartoogechaye Creek but was later turned to face the relocated road in approximately the direction the present church faces. This building continued to serve the church until plans for a new church were presented and adopted on June 18, 1944. Mrs. Flora Crawford wrote the following description of the original church: There were two doors in the front of the church. There were four long windows on each side of the building. On the inside, the walls were wainscoted up a ways and covered above that with brown burlap to the ceiling. Oil lamps sat on brackets between the windows down each side of the building, with a large one in the pulpit. As the membership grew, wires were stretched across the room and curtains hung across to make partitions for classes. There were two cast-iron stoves, one on each side of the building. The stove pipes went so high, then across, met in the middle, joined together and pipes ran up to the flu in the middle of the church. When the original building was torn down, it was noticed that the rafters had been reinforced by wrapping hickory withes around them. This probably was done when the church was moved many years before, but it withstood the wind and weather very well, with much creaking and groaning. In 1922 JJ Kiser (grandfather of present members Brenda Gilkey and Dale Kiser) donated land to Mt. Hope to be used as a cemetery. There were two burials in the cemetery, both infants. For whatever the reason, the church decided to terminate use of the cemetery. However, to deed the property back to the Kiser family, the two infants graves had to be dug up and placed elsewhere. In February of 1951, Dale Kiser and his father Wood Kiser dug up the graves and they were placed elsewhere. The property was deeded to Wood Kiser. son of JJ Kiser in 1953. On 1/1/1939 the church decided to install electric lights. 6/3/1939 the pastor, R. F. Mayberry had to remind members to bring their dime to help pay the light bill. 2/21/1943 - Plans for a new church building were presented and adopted. 6/18/1944 - The church members approved tearing down the old church building and to begin construction of a new one. ​The picture below was taken in the early 1940's. It is of a number of members of the Mt. Hope Baptist Church congregation including some present members. The picture was taken at Lord's Acre, an acre of land located at the intersection of the present Carl Slage Road and the Crawford Road. It was so named because the acre of land was planted in corn and when harvested the proceeds went to the church. 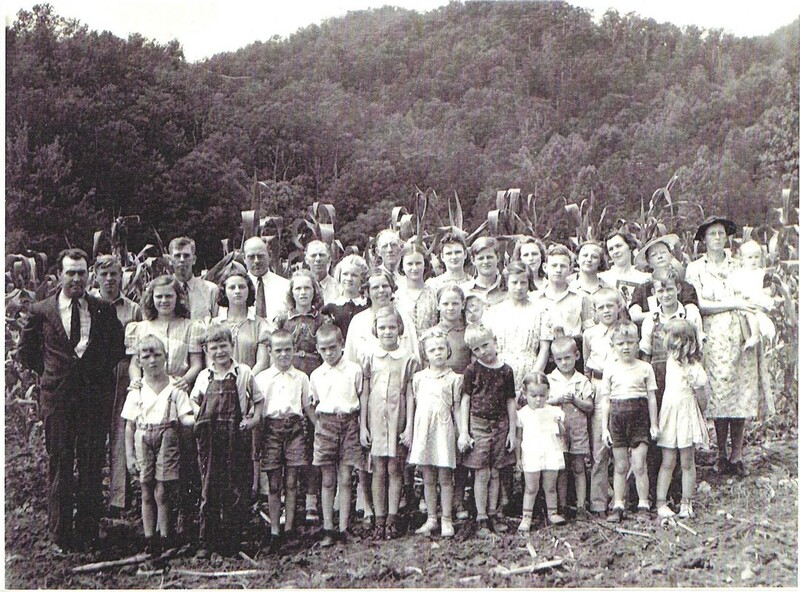 In the picture are members of the Cecil Crawford family, the Harold Brookshire family, the John Dalrymple family including Willy Dalrymple family, the Martin family and a few others.